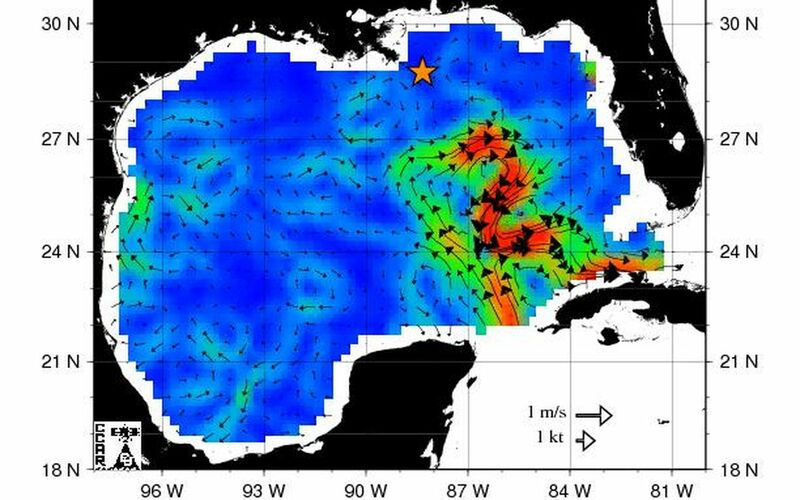 The northern portion of the Gulf of Mexico's Loop Current, shown in red, appears about to detach a large ring of current, creating a separate eddy. An eddy is a large, warm, clockwise-spinning vortex of water -- the ocean's version of a cyclone. 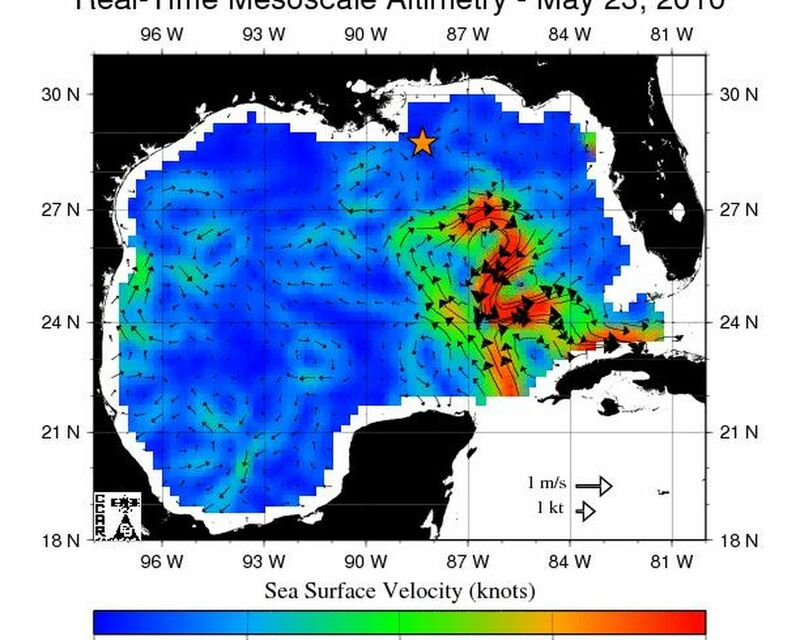 This image, created with measurements of sea surface height from multiple satellites, including the NASA/French Space Agency Jason-1 and Ocean Surface Topography Mission/Jason-2 satellites, shows the speed and direction of surface currents in the Gulf. The star shows the former location of the Deepwater Horizon, the drilling rig that exploded and sank in April, and has been leaking oil since. A large eddy between the leak and the Loop Current might keep, at least temporarily, some of the spilling oil from reaching the Florida Straits, the ocean channel between the Florida Keys and Cuba, and being transported to the east coast of Florida and northward into the Gulf Stream. This map was produced by the Colorado Center for Astrodynamics Research in Boulder, Colo. 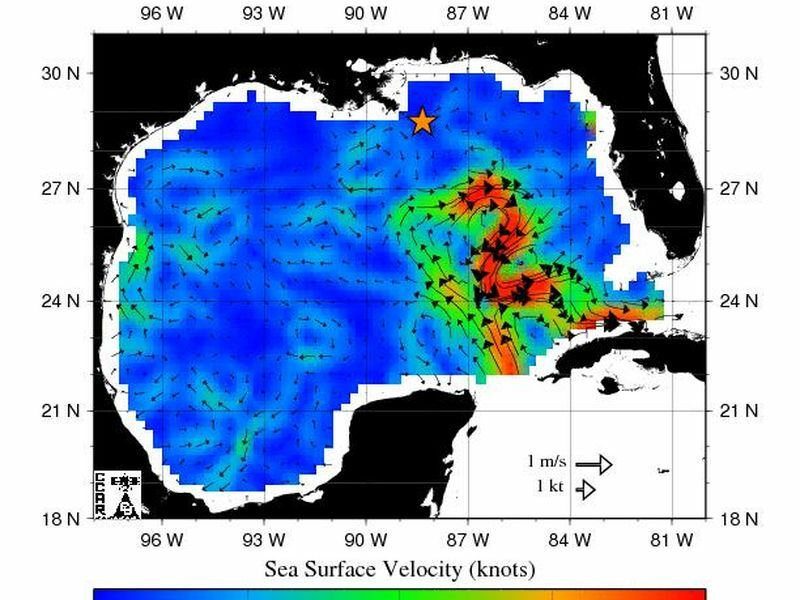 The center processes satellite measurements of sea surface height in near real-time to create maps of the Gulf of Mexico, showing the location of medium-sized eddies and fronts. More information on these data products is available at http://argo.colorado.edu/~realtime/welcome/ . 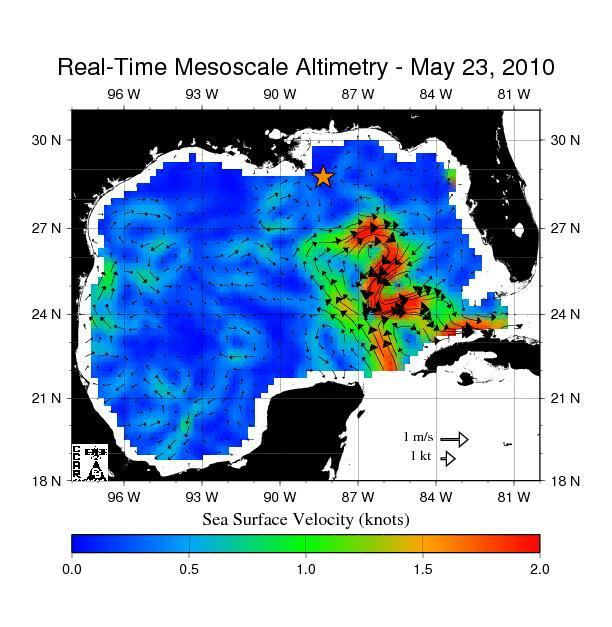 For more information on NASA's ocean surface topography missions, see http://sealevel.jpl.nasa.gov/ or to view the latest Jason data see http://sealevel.jpl.nasa.gov/science/jason1-quick-look/.